While there have been references to 3D printing in space made here, they’ve so far been only speculative. Now there’s a specific project with a real name to toss around the water cooler, and it’s a pretty cool name. SpiderFab is NASA’s hopeful path to reduced costs and the incredibly realistic capacity of building spacey things like station components, satellites, modules, and eventually entire spacecrafts IN space. The project, proposed by Tethers Unlimited Inc., has received a $100,000 grant from NASA’s Innovative Advanced Concepts program, which has the most appropriate name for a program that’s funding 3D printing research. The main benefit of building in space the stuff that’s made to operate in space is avoiding the whole launching process, as it’s very costly and quite strenuous on whatever is being sent up. There are extra costs in having to build equipment that can survive liftoff, and the housing and brackets to hold everything in place add additional weight; rocket fuel is really expensive, so you can see why you wouldn’t pack much for a lunar vacation, and why NASA engineers are pretty uptight about weight optimization (reduction). Besides saving costs on fuel, skipping the launch process allows engineers to engineer components that are more engineered for their space purposes rather than for folding up into a rocket, being blasted through Earth’s atmosphere, unfolding, and THEN doing space stuff. These space-built components could also be more complex, as those that are designed to go through heavy-g forces are more sturdy than they are intricate; since they’ll never have to go through that kind of strain, and since 3D printing can produce micro-lattice structures, components can be built for micro-g environments out of ultralight materials. Complex is nice, but in space bigger is still oftentimes better, and of course this project intends to produce larger antennae than ever before. 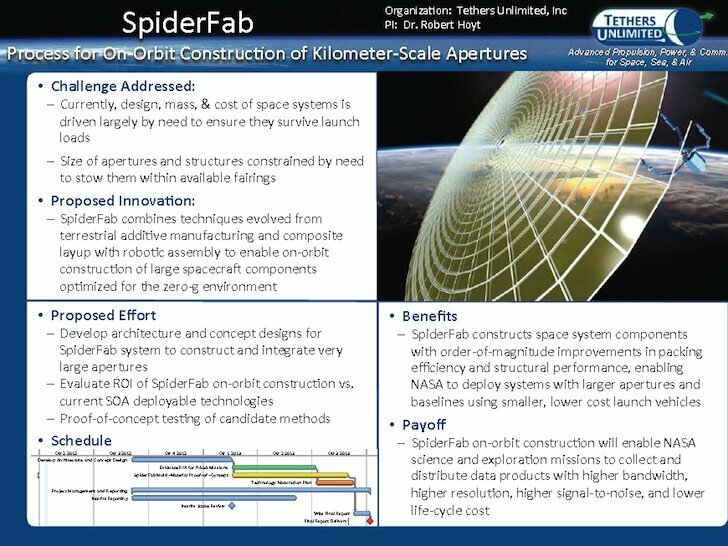 The SpiderFab plan is to send up by conventional means a large 3D printing structure which will orbit Earth. Then base building materials would be sent up in a much more efficient manner, as there’s less weight and engineering necessary to send base materials because they’ll more easily make it through exiting the atmosphere, so that means less fuel per material and fewer costs per pound. This project involves researching printing with conductive materials, so NASA is ambitious about what will be constructed in orbit. From high-gain antennas for deep-space communication, to interferometry equipment for identifying terrestrial planets, SpiderFab weaves its web of next-generation innovation. Included in the future designs of these structures will be in-situ resource utilization, meaning they’ll print from materials found in space, like from asteroids and other space debris (retiring satellites?). Certainly this in-orbit type of spaceship building is necessary to make come true our dreams of interstellar travel. From what Curiosity has been sending back though, I’m ready to colonize Mars, and I’m glad there’s now a NASA project dedicated to researching some of the 3D printing technologies that will be necessary to make that happen. Building structures on Mars isn’t part of the SpiderFab agenda, but the breakthroughs that are made within the project will certainly help to accelerate my plans to tour Olympus Mons. See the NASA page on SpiderFab here.